Happy Monday, everyone!! Today’s look features two of the newest arrivals that launched over at the RP Everyday Shop on Friday! 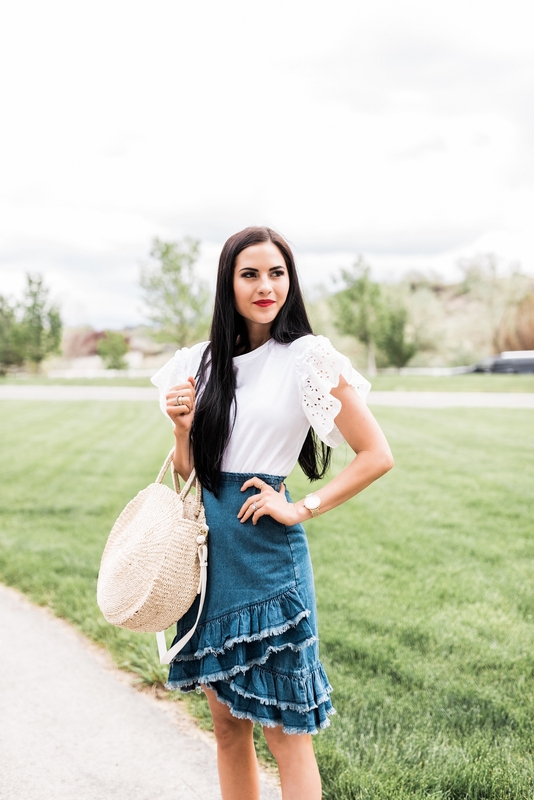 This denim skirt with the flirty, fun ruffle hemline is a must-have for summer!! 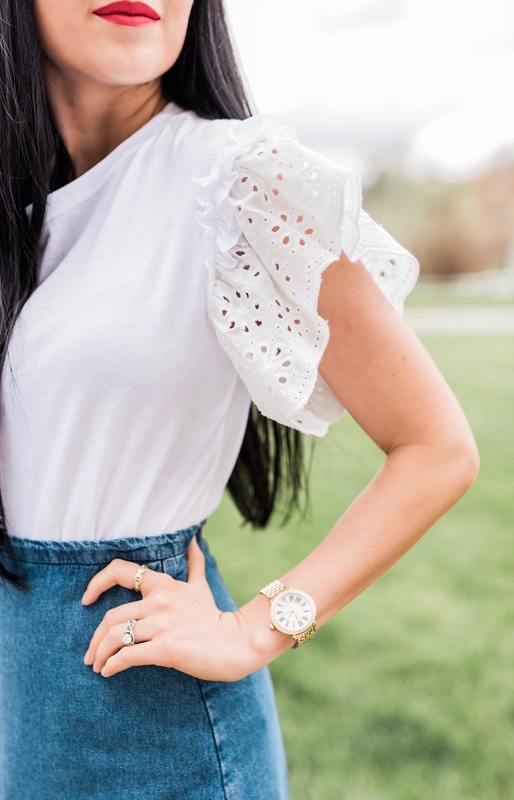 Pair it with a cute white tee (like this eyelet one) and some chunky wedges to create a cute, casual look that you could wear to church, to a day full of meetings or just out to lunch with your girlfriends or sisters! It would also make a cute Memorial Day or Fourth of July option! Add a bold, red lip and some red statement earrings or even wear red sandals (like this cute pair) to tie in more pops of red! Click here to shop all of the RP Everyday Shop new arrivals for cute, affordable pieces! I love how dramatic the sleeves are on this Top. It really elevates it beyond the basic white tee! Such a cute look!! I need this tOp ? Please restock the jeans! Simply sooo cute and beautiful Summer look! ???? The ruffles on that denim skirt is amazing!! Love this outfit! These photos are stunning, and that skirt is EVERYTHING! Love all these super fun ruffles!! So Gorgeous! Obsessed with your skirt!!! so cute and perfect for summer!! Such a sweet look! I love the variety of ruffles. I am obsessed with this ruffled look I love it! That skirt is gorgeous! I’m obsessed with the ruffle! Lokking absolutely flawless and so gurly here! Never knew that denim skirts could be so feminine and beautiful! I love this skirt but im wondering abOut the sizing. Im usually a small but feel like it would be too small if thats the size rachel is wearing. Any tips would be helpful! What a cute spring and summer outfit. I love the entire look. I love wedge sandals for spring! Super cute and super comfortable while giving you an alternative to wearing flats so that way you can be comfortable and stylish (I rarely wear flats and I don’t like to wear tennis shoes. Although I realize I need at least one or two pair of each). I love the way you paired the ruffled jean skirt and white ruffled top. You let the ruffles speak for themselves by just adding a few accessories and not having too much color or anything else clashing with the outfit. Love.